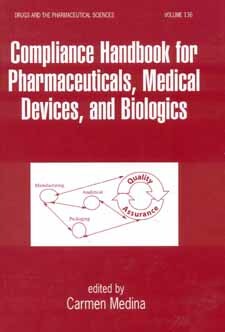 Pharmaceutical Compliance Book from C.H.I.P.S. Whether preparing for regulatory submissions or preapproval, investigator-directed, routin, or foreign inspection, this reference is assured to enhance the facility- and compliance-readiness of any company requiring a strengthened approach to compliance and total quality management. Providing innovative programs for every key quality system within an FDA environment, this guide evaluates critical compliance and quality challenges within the context of FDA expectations, current industry standards, and emerging global trends.